Just a little, funny reminder that even the big companies make mistakes. I like art and good esthetic design. Of course the "guts" must be perfect as well. And I'm sure ANKER (soundcore) has hidden all the ingredients inside we would like to see. A handbag? But no chance to store something in there, already full of good stuff! Are there not grills on the holes, to keep things out them? That is funny though. It is amazing that someone doesnt put 2 and 2 together when designing something like that. There's a saying that goes like so: "Nothing is foolproof to a sufficiently talented fool" and "If you make something idiot-proof, someone will just make a better idiot." Haha I love that saying. 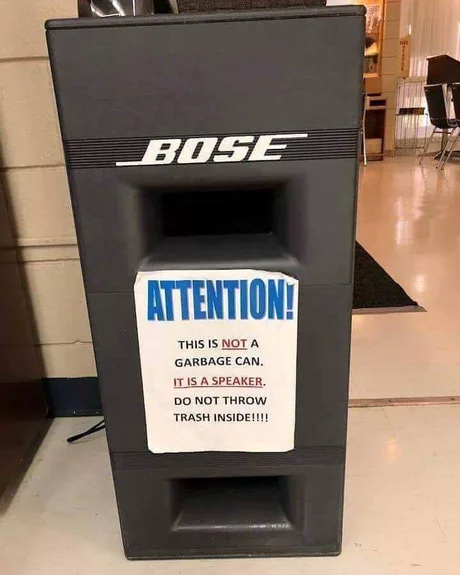 But it got me thinking, which one is the idiot here, the designer who made a wastecan speaker, or the idiot who looked at Bose and tossed a candy wrapper into the most expensive can they could?